It's a groovy kind of app. Flick! 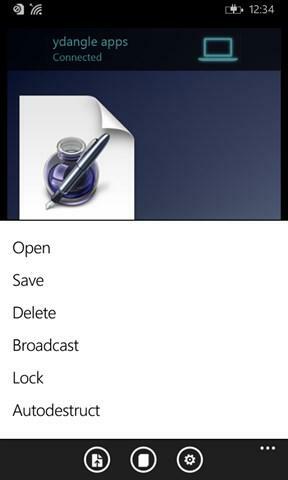 The easiest and simplest way to share documents, videos and images between Windows, Android, Apple and other devices and operating systems. Check our website getflick.io for details. It’s all done by simply flicking from one device to any nearby devices running the Flick app. As one of our clients said, "It's finger flicking good! You just have to try it." No longer is there any need for trying to connect via complex file systems, locating directories and files to share. You just Flick it! Check out our YouTube videos to see it in action at http://www.youtube.com/user/GetFlickNow One of the really cool features is Auto Destruct! You can set images or notes you send to your friends to auto destruct after a set amount of time. No more embarrassing photos or notes floating around! Great fun.... The app uses your local WiFi connection to connect devices and share files with other devices on your network. Photos, videos and documents are available from within the app. Any type of file can be shared. To flick files to and from your PC or Mac, visit getflick.io to download the free Flick for Windows app. Try our app now and please provide us with your feedback. 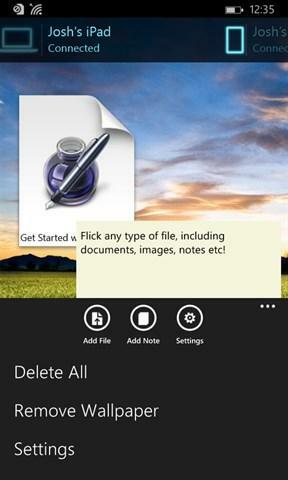 Features: - Flick photos, videos, notes, and documents to Apple, Windows, and Android devices - Pick files to send from anywhere on your device, including cloud storage - Broadcast files, photos or notes to all connected devices - Set photos, notes and other documents to Auto Destruct - Save received photos to your library - Take a photo directly within the app - Save documents received to your device or cloud storage - Choose your own wall paper for your Flicktop - Add files to your Flicktop directly from Dropbox Try our app now. You won't be disappointed! To get the full experience download the Mac or PC version from the flick website at getflick.io. NB. If you do experience a connection problem please make contact with us before posting a bad review. We have had hundreds of thousands of downloads and only a handful of connection issues, all of which we have been able to resolve for clients.